Oakley has released a new frame the Jupiter LX - named after the Roman God of light and sky. The frame shares many accents that were seen on the Frogskins especially around the bridge. To me it appears to me a modern version of the sunglasses. The Jupiter LX is a combination of smooth lines and attitude and still maintains the classic Oakley look. Sunglasses should hit Oakley accounts in the next week or so if they aren't in stock already. 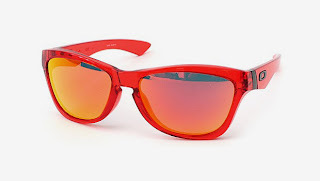 You can purchase them online at Oakley.ca for $175. These guys are also flying around the net but I have not heard that these will be available as part of the Spring/Summer collection. However I am sure we will witness a vast array of colour options over the next year.